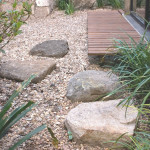 Today, we will continue with our design for the small residential Japanese garden that we started in the last post. If we go back to my post Japanese garden for a small yard, I identified seven ideas to remember when creating a successful residential Japanese garden. We shall consider these principles when filling out our design. We begin by looking at the above principles. We see that implying nature, having evergreen plants and a simple plant palette all apply to selecting trees. So lets start by adding some evergreens to our residential Japanese garden design. Let me point out that ALL of these evergreen trees will need to be pruned. Otherwise, they will overgrow the garden. The good news is that if it is done every year, it does not have to be too big of a job. This is a Japanese garden design and it will require maintenance and aesthetic pruning. This can be an enjoyable pursuit. It can actually add to enjoyment of your garden. 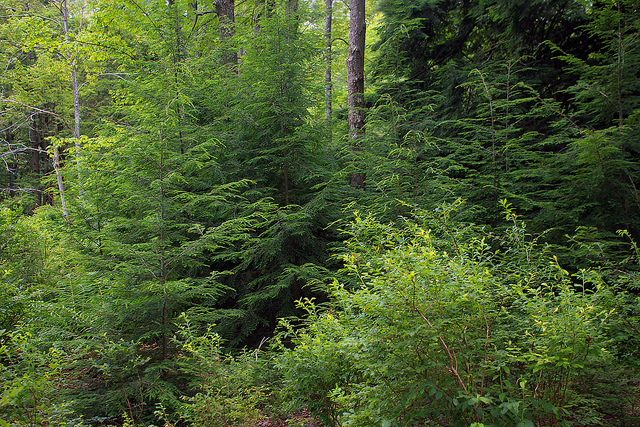 The first evergreen tree we will add will be a native to a large portion of the US, the Canadian hemlock (Tsuga canadensis). This is a fine textured evergreen. It is slower growing but will require annual pruning. 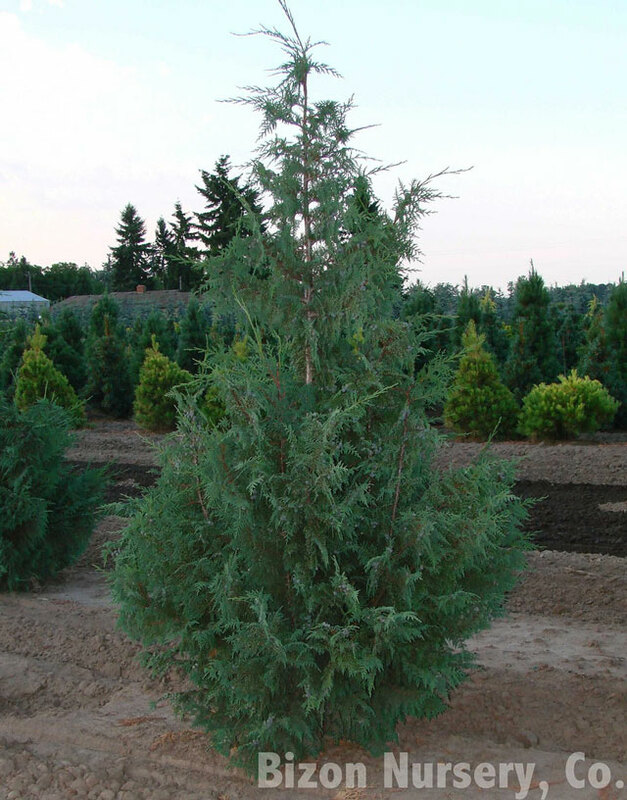 If you want a smaller tree that would not require as much pruning or have Hemlock Woolly Adelgid prevelant in your area, you could use a Nootka Falsecypress (Chamaecyparis nootkatensis) instead. There are lots of weeping varieties available. However, the straight species or the cultivar Sullivan (Chamaecyparis nootkatensis “‘Sullivan’) would be better for this design. Here is how our design would look with a couple of these trees added. Note you can click on my images and you will go to a larger view of it. To return to this page just hit the “Back” button on your web browser. The 2nd tree we will add will also be an evergreen. This time it won’t be a native tree. 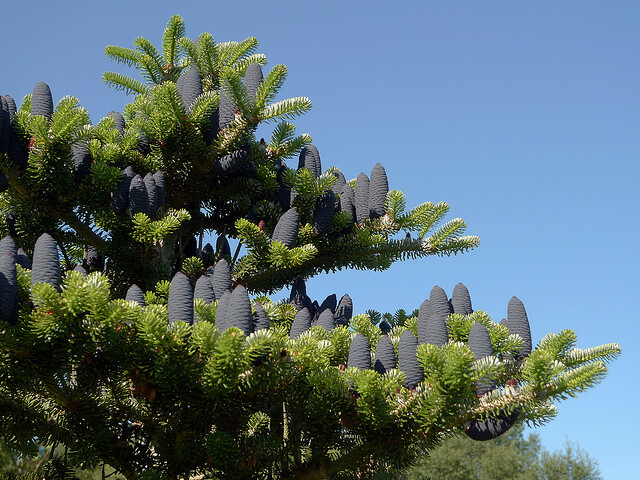 It is an evergreen that looks great in the winter when it’s purple colored cones add color to the landscape. This tree is the Korean Fir (Abies koreana). Here is how the design would look with two of these trees added. 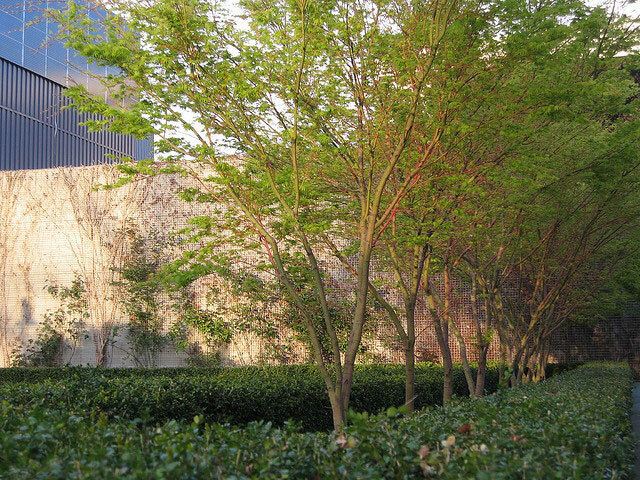 While we do want to add mostly evergreens, we also want to imply nature in our designs. 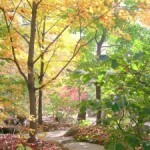 One of the most basic facts of nature (at least here in the Midwestern US) is the change of the seasons. Spring changes to Summer to Fall to Winter. Having plants that signal these changing seasons is one of the joys of having a garden. In Japanese gardens, the Japanese maple (Acer palmatum) is one of the plants that do this well. 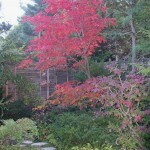 While Japanese maples are frequently used in gardens in the US, it is usually a purple leafed form, such as the cultivar Bloodgood (Acer palmatum ‘Bloodgood’). The purple leaf form are certainly fine trees. I have several in my yard myself. In this design we are trying to create a more natural looking effect. We will therefore use a green leaf form as it looks more natural. If we were in zone four or colder we would want a hardier tree such as the Korean Maple (Acer pseudosieboldianum). 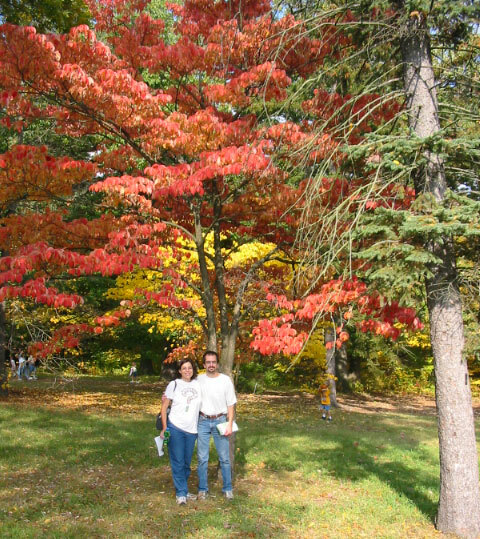 While the Korean maple is not quite as graceful as the Japanese maple, it is more cold hardy and has a very nice Fall color display. In our design we will just use a regular green Japanese maple. Here is how it would look added to our design. If instead of a Japanese maple, we wanted a tree native to the US, we could use any number of medium growing ones with a good seasonal display. Some trees with good multi seasonal interest include the Redbud (Cercis canadensis), American Smoketree (Cotinus obovatus), and Flowering dogwood (Cornus florida). 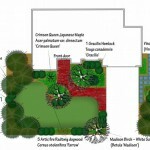 In the next post, we will add the rest of the trees and the shrubs for this residential Japanese garden design. If you liked this post please share it. You can click the appropriate button below to do that. I’ve really enjoyed your posts about Japanese style gardens. My backyard is very similar to the one you designed, only it is reversed, has a deck instead of a patio and my house is two stories. I live in an Arts and Crafts style neighborhood with very strict covenants. We all have the same fence in our back yards and cannot change them. I feel like the Arts and Crafts style has an Asian feel to it and would not have chosen the tall, white vinyl, scalloped picket fence for these homes had I been the architect. I’m not an architect so what do I know? The fence has a cottagey feel to me but I am not fond of this style of landscaping. Do you think I could pull off a Japanese garden in my backyard with this fence? I live in Zone 4 Colorado so would have to use many alternate plants which I’ve been researching. I guess I could plant an evergreen hedge which could get pretty pricey. I am also fond of my backyard view-a meadow with a backdrop of tall Cottonwoods and mountains . I welcome any suggestion! I agree Arts & Crafts house with white vinyl picket fence does not sound like my idea of match made in heaven, even though I know there are plenty of examples of this. As I see it you have a few obstacles facing you. I don’t think the white vinyl fence would look appropriate at all. I do think that an evergreen hedge could effectively eliminate that issue. If you are patient and the size of the hedge is not too large you can save a lot of money by using smaller plants. I planted 25 Hicks Yews as a partial hedge. I bought 1 gallons for about $8 a piece. I also had to wait a LONG time for it to fill in. That being said the $200 cost for the hedge plants instead of the $1,250 it would have been for $50 plants made it easier to afford. I also think the fact you have a deck that probably elevates you a bit above your landscape makes it a bit difficult to integrate the house and the yard together such as they are in this design with the patio and landscaping at the same level. It may be better to create a smaller outdoor living area (i.e. patio or seating area) with a Japanese style garden around it. This could be a corner nook or even a garden next to your deck with a bench on it to sit at. I do think you can create a very nice landscape perhaps even with a Japanese feel, but I think it may be difficult to pull off a full Japanese garden landscape in your situation. Perhaps another style would fit your house better. You mentioned the view of the meadow. Perhaps a landscape that incorporates a meadow feel may be appropriate. What specific elements or features of Japanese gardens appeal to you? I want to plant a cluster of evergreens (trees and bushes) in my large side yard. I like the weeping Nookta cypress and the gold cypress and the threadleaf cypress bush. I like the idea of an all cypress grouping. I have already planted two gold cypresses but they both died! We have heavy clay soil – I don’t know the PH – and I know I will have to amend the soil if I want to succeed! I am in Zone 7 (Rhode Island on the south coast – Newport. I also love the Hanoki cypress and have suceeded with these, mostly! Can you show me a design and advise me on how to arrange these evergreens?